Ah, how to work from home and make money, too! It seems like an elusive dream. But, I assure you, it’s not. 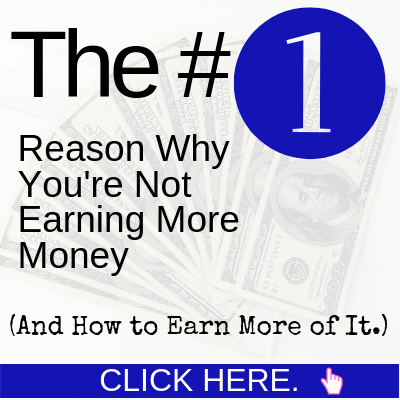 I’ve actually created extra income in a variety of ways working from home in the past. Let me tell you about some of them. READ –> I recently created this post, 50 Real Ways to Make Money Online. Yup, I’ve done it! It all started when I got an email from Lush asking if I would be interested in doing a mystery shop from them. They would pay me to shop at the store. Would I be interested? Would I be interested?! Of course I would! Mystery shopping can be great. I always just took the restaurant shops and enjoyed a nice meal. For this job, you need to observe what’s going on around you and sometimes take notes too. I had to check the bathrooms, remember the hostess and server’s names and what they looked like, notice everything about my meal. When I got home, I had to upload a picture of my receipt and write up a report of my experience. Sweeping is entering sweepstakes for cash and prizes. Now, THIS was a lot of fun. This is something people dedicate hours of their day doing. Just entering, entering, entering for prizes. It’s a numbers game. You have to be in it to win it, and the more you enter, the more likely you’ll be to win. I won some great things! A $1,000 shopping spree, an ipad, an ipod touch, tickets for Disney on Ice, and my favorite…a trip for 4 to the Bahamas! 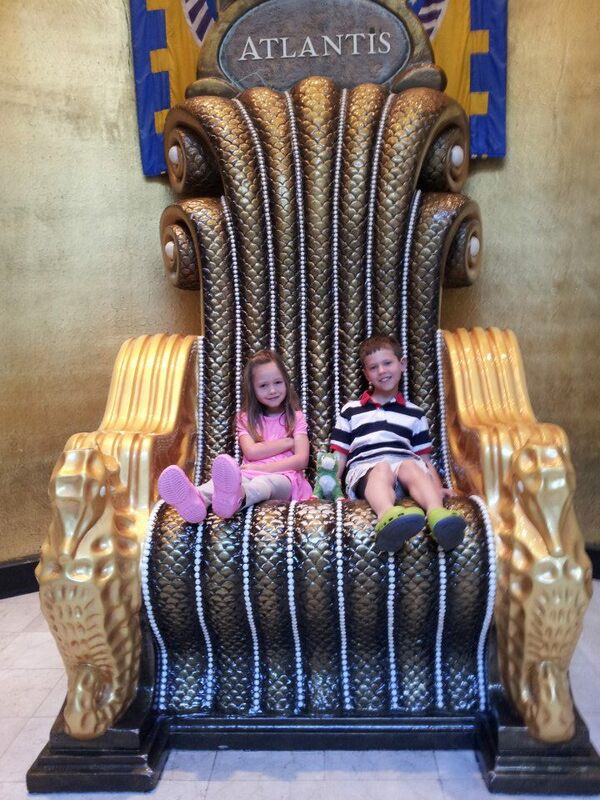 Here are my kids relaxing on the big Atlantis chair at the hotel. I also won lots of coupons for free M&M’s, t-shirts, hats and other smaller items. There are websites out there that list different sweepstakes, so you can go on those and enter away. The one I used was online-sweepstakes.com, but there are many to choose from out there. Amazon Mechanical Turk is a site where you can sign up to do small tasks and get paid. These are tasks that they haven’t figured out how to get a computer to do correctly yet. That should give you an idea of the types of jobs you will be doing here. For instance, there might be a job where you have to go through 100s of photos and tag them in some way, or check to see if any of them are inappropriate. There are some bigger writing jobs and research jobs. Some of the tasks require you to take a test and get a sort of certification to be able to do it. The positive thing about Amazon Mechanical Turk is that you can pick and choose what you want to do. You don’t need to be on the phone. You can do it in your spare time. You can make your own hours. I’m sure there are regular ol’ companies out there that will let you work from home at least some of the time. My husband can work at home any time there’s bad weather. Although, unlike me, he really doesn’t enjoy working from the comfort of home. He says it’s “too boring.” How dare he?! Anyway, I did work exclusively from home for an email marketing company that was located in Maryland. It was a short stint, but a decent one that paid well. And I’m sure there are other jobs out there like that if you take a look at the different job sites. Of course you’ll need to have the appropriate experience for this type of job and the proper equipment. Lionbridge (and there are a couple of other companies out there like them) is a company where I worked exclusively from home. It’s been a while since I’ve worked there, but if I remember correctly, I had to work a minimum of 10 hours and could work up to 20 per week. I was shown different Internet Explorer websites, and I had to rate them. This is a job where you need to use Explorer and you can’t use a Mac. The upside to this job was its semi-flexibility of being able to fit the hours when I could. I didn’t need to be on the phone, so my kids could be nice and loud if they wanted. I was a member of Young Living Essential Oils and worked that business for about a year. I am still a member because I love their products, but I no longer try to work the business. All in all, I don’t think network marketing companies are a terrible way to make a living. (Do your research though and make sure you’re getting in with a good one!) It wasn’t a great fit for me because I’m an introvert and I get really drained talking to people all day! lol I do much better sitting on my computer and typing our articles like this one. Finally, here is my favorite way to make a living online. It’s all about affiliate marketing and blogging! I get to be creative, use my brain, help people, AND make money. 7. Affiliate Marketing / Blogging. Affiliate marketing is my absolute most favorite way to make money online. Affiliate marketing is basically matching people up with the thing they’re searching for online. For instance, say you’re thinking about getting a Vitamix. (I highly recommend that you do! I love mine!) I can write a blog post about how much I love my Vitamix, the benefits of owning one, and why you should also own one versus another brand. I can then add a link that goes off to Amazon. I have a special tracking link from Amazon called an affiliate link. If someone clicks on a Vitamix link (<– affiliate link so you can see what it looks like) in my review and purchases, I’ll get a commission. There is no additional cost to the customer. The commission is a way for Vitamix and Amazon to compensate people for promoting their brands. This is win-win-win type of work. I get to write about something that I love. A customer gets the thing they were looking for. And I get paid a bit for matching up the customer with the thing they were looking for. It sounds like a lot, and it can be if you’re trying to figure it all out on your own. I learned everything I know with this great training website, Wealthy Affiliate. They teach you alllllll the things. Even though it sounds like a lot to learn, Wealthy Affiliate takes you through everything in a super easy step-by-step format. Before you know it, you’ll have a complete site up and running and making money! 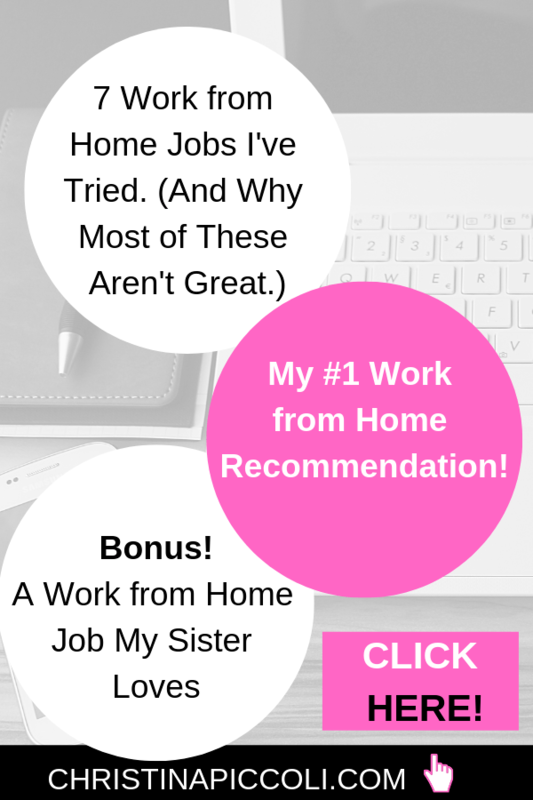 Bonus Work from Home Opportunity That My Sister Loves! 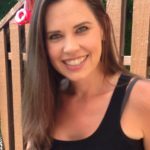 My sister, Mandy, currently works from home doing something that SHE loves, and I thought it would be great to mention it here. While it’s not something I’ve done, it’s something that I do recommend to people if network marketing and affiliate marketing really aren’t your thing. She works with a company called VIPKID. VIPKID is a company where parents in China can sign their kids up for English classes through them. The kids in China already get English classes in school, but these are additional classes that they can take from “real” Americans. 🙂 This gives them the chance to learn about our culture and use English in the way that we would. The starting pay is from $7-$9 (depending on how well your interview goes) per class. The classes are 30 minutes. But there are other bonuses that you can earn along the way. My sister generally makes about $10 / class, or $20 / hour. Another thing to consider is if you have kids who wake up during your teaching time, this could be an issue. (Another reason I love affiliate marketing. My house can be a zoo and it doesn’t matter one bit.) You’ll need to have quiet time during your teaching sessions. You don’t need a teaching degree, but you do need a Bachelor’s degree to apply. You will have an interview and a mock teaching session. If you sign up with my sister she can coach you through the process. You set your own hours. You don’t have to live by anyone’s rules. You get to be creative. You get to have fun. You get to help people. (Ah hem. Your house can be a zoo as I mentioned. Not that mine is or anything…) It does not get better than that. In order to really do it right though, you will need the proper training. You want to set yourself up for lasting success. That’s why I recommend Wealthy Affiliate. They’re the platform that taught me everything I needed to know, step-by-step from start-to-finish. I still learn from there on a daily basis. You can try Wealthy Affiliate out for free and see what you think! Have you done any work from home jobs? Did you like it? What do you think of the work from home jobs I’ve mentioned here? I’d love to hear your thoughts. Leave me a comment below! Hello…good article. I’ve been dabbling in the online game a while, but never gone in full pelt. The Lionbridge thing is something that interests me so i’ll have a loot at that further. I thought about teaching English too, but it was the hours that made me think twice. I’m a fan of affiliate marketing, but it does take a while before it pays off. Affiliate marketing does take some time to build it up, but I do think it’s worth it because you’ll have residual income that will continue to come in long after your articles have been written. Lionbridge is ok. But, as mentioned, just really, really boring after a while. Some people don’t mind that, but I had trouble with the tediousness of it. Christina, I have spent a lot of time researching various work at home sites and you had some new ones I hadn’t heard of. I’ve heard of and used Wealthy Affiliate and I agree, it is a great program for learning Affiliate Marketing, probably the best I’ve found thus far. Thanks for posting, this is great content and I plan on coming back again a few times to review. I’m glad you use and like Wealthy Affiliate. It has helped me tremendously! I have another post all about Wealthy Affiliate here that takes a look inside the system. I really enjoyed your personal experience and input with your options. It really broke the process into simplified info bytes and very detailed too. Very forthright and I agree sweepstakes are a hit and miss opportunity . The photo with your kids on the throne of Atlantis is amazing and brought a smile to my face. 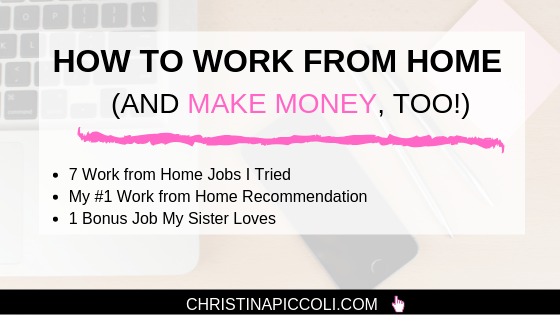 Hi Christina, thanks for sharing a range of ways to work from home. I really like that you gave your experiences of them too. The sweepstakes method sounds fun, but I can how it can get tedious and feel like you’re not getting much done. At the moment I’m working from home as an Affiliate Marketer and I really enjoy it. It allows me to promote products and earn income passively through my blog. Thanks again for sharing this list, I’m sure there will be many others who can benefit from this post. I think you have mentioned a few great ways to work from home and make money doing it. I am a fan of affiliate marketing and I see a huge potential in it, not just for staying at home, but to make serious earnings out of it. Wealthy Affiliate is definitely the best place to get the basics and to start your own business in no time. Hey Ivan! Thanks for stopping by and sharing your perspective. I’m glad that you’re a member of Wealthy Affiliate and you see the huge value in it. I wouldn’t be anywhere without that site. It is THE best for training and keeping up-to-date with the latest and greatest in the world of affiliate marketing.